Counting scales can be a valuable addition to a T-1000 Bagger. 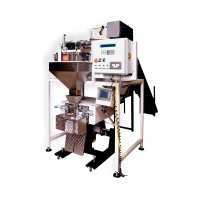 Advanced Poly Packaging offers a UCS-2400. Similar to our UC-2400, this system includes 3 functions never before available as one machine. With vibratory parts counter, check weigh scale, and a net-weigh counting scale, this model is perfect for users packaging in single counts up to hundreds! The US-7000 is an automatic feeding solution for any bulky products. It is accurate up to .01lbs. Double your production with the dual head design or keep it simple with a single head scale. Advanced Poly also offers you the US-9000 for your precision counting of parts that do not separate or run through a parts counter. Fed at optimum speed from a vibratory bowl feeder, this model is also accurate up to .01 lbs. Perfect for the business with smaller batches or lighter parts that can't be counted on a typical net weigh scale. Model UCS-2400 "Combination" System provides the highest flexibility with multiple functions. As a High Speed Parts Counter, the system uses vibratory bowl technology to feed parts through an optical frame which can detect the smallest of parts. Press one button on the user-friendly touch screen to turn on check-weigh function to ensure the accuracy of the counts. Finally, press the same button to toggle the operation to a net weigh-counting scale. Model US-9000 Netweigh-Counting Scale provides the ultimate level of accuracy due to the precise level of incremental bowl vibration changes. The vibratory bowl automatically ramps down to a "trickle" feed rate and stops feeding at the "trim" setting to avoid overshooting the desired count/weight. With several scale hopper sizes load cells available this model the US-9000 can be configured specifically for your range of products. The US-9000 is perfectly integrated with the T-1000 bagger with a large touch screen and a heavy-duty, vibration dampened stand. Model US-7000 Netweigh-Counting Scale provides great performance with a good level of accuracy. Vibratory pan feeders automatically ramps down to a "trickle" feed rate and stops feeding at the "trim" setting to avoid overshooting the desired count/weight. With several scale load cells available this model the US-7000 can be configured specifically for your range of products. The US-7000 is perfectly integrated with the T-1000 bagger will a large touch screen and a heavy duty, vibration dampened stand.